I cannot believe this book because I came into it with very little knowledge — it sounded interesting from what I’d heard and I knew that I’d probably love it because it’s Seanan McGuire — and I was not disappointed. While I went into this thinking that it was fantasy, it was definitely sci-fi. There’s alchemy and creating people for scientific purposes. Twins yet not twins. (Aka, Roger and Dodger.) Separated from birth to see what might happen. Yet, they can contact each other remotely without even knowing how they’re doing it or their relationship. I loved how this book covered the breadth of their lives. It started from when they were children and kept following them into their late-twenties or early-thirties. And, throughout it, you get to see a peek of what is to come. It’s an incredibly impressive work. When I got my hands on this ARC, I wasn’t expecting the size. It’s around 530 pages, which is huge compared to the Wayward Children series that I’m familiar with. 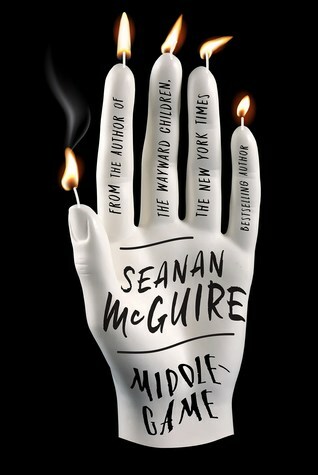 But, I’m so glad that I was finally able to see how McGuire writes a novel, not a novella. The main characters are incredibly compelling. I kept wanting things to go differently and that opening??? Damn. It starts with disaster at the end and then you’re left wondering how the hell you’re going to get there. Which only gets more confusing as the book unfolds and you find out more. But, let me backtrack a bit rather than just gush about how much I enjoyed this book. Roger is the twin that is gifted with language. And language isn’t just words. It stretches further than that and shows the full breadth of what language is, even though we don’t consider it so. Then, there’s Dodger. She’s the twin gifted with math. Numbers are everything to her, the only thing that matters… besides Roger. The book really starts out with their childhood and how they “meet”. Then we follow them as they grow up. At one point, there is a major suicide attempt and hints of self-harm, which gets remembered throughout the story. It wasn’t easy to read, but it was well-handled. Also in the book is the science-y stuff that helped make them. Personally, I found that side less compelling. I wasn’t that interested in what the “bad guys” were doing or anything like that. While I found it interesting to read and it added to the story, I just wasn’t that compelled by it. I wanted to know more about the relationships, not the numbers/science. Which is kind of why I took a half star off my total. I just didn’t feel the science side of the story was as well fleshed out as the characters were. There were some terms used that I vaguely understood — as in, I knew what McGuire was getting at, but I didn’t quite know what it meant at the same time — and even when I finished the book I wasn’t that sure. However, I never wanted to put this book down. I just wanted to keep reading it because I had to know what crazy things were going to happen next. That’s so great to hear! I’ll have to keep an eye out for your review!